Or "contemporary", as modern handmades are often called. Might be called a latticinio. 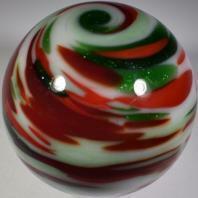 This looks like a Cuneo Furnace (Steven Maslach) marble. I believe Cuneo is no longer in operation. They made beautiful latts with delicate features. Not only did they make marbles, they made eggs and hearts. Look for short marble canes with a semi formed marble at one end. I had no idea they named these, as well! Interesting! !